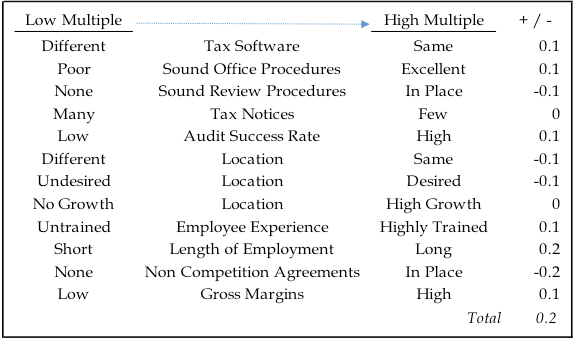 As a tax practitioner for more than 40 years and a business valuation professional for 25 years, sales and valuations of tax practices have crossed my desk numerous times, in addition to making two acquisitions myself. As with most, if not all, tax practice acquisitions, the buyer and seller have very different points of view. From the seller’s perspective, there are two objectives. First, how can a seller maximize the best price, and second, how does the seller place clients with firms offering the same or better quality of service? In a perfect world, the seller will be paid upfront for his or her tax practice, while spending a minimal amount of time transitioning the personal and professional goodwill to their buyer. This type of deal does happen; however, the risk to the buyer is huge. For this reason, few practices are sold in a lump sum. There are two buyer’s objectives as well. First, the buyer wants to maximize new client billings at the best price, while retaining those clients over a long period of time, and second, the buyer wants to make sure that the two merging practices “fit” geographically and in the similar type of tax service offered. For client retention to work, the personal and professional goodwill of the seller(s) must be successfully transferred to the buyers in a reasonable period of time. To mitigate these differences, there must be a compromise between the buyer and the seller. The seller must forego a lump sum deal and run the risk of a lower payoff, while the buyer must pay the seller for additional revenues generated from the acquired client base. To accomplish this, the price is expressed as a multiple of annual revenue receipts, such as .75, 1.00 or 1.25, depending on the buyer’s and seller’s perception of the quality of the practice. Why receipts over billings? Simple – cash is “king!” The amount should be paid out monthly over a period of years – generally three to five years – depending on the transition time needed to transfer goodwill to the buyer. Here’s how a typical acquisition would take place. 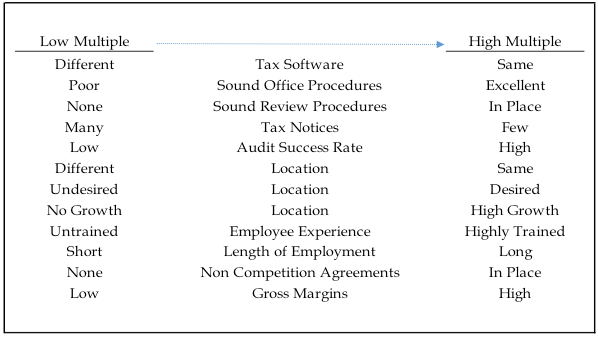 Buyer A buys Seller B’s tax practice at a multiple of 1.00, based on the historical client retainage, gross margins and potential for generating additional fees within the client base, as well as other factors that I’ve listed later in this article. Annual fees received are $500,000, and because the seller does not plan to work after the acquisition date (more on that to come), a four-year payout is agreed upon. In the first two years, there was a drop off in revenues when several clients went their separate ways. However, due to increased fees, revenues returned to the $500,000 level and grew 5 percent in the fourth year. As the illustration below shows, the actual payout received over the four-year period is $501,500, discounted to $477,153 using a safe rate of 2.5 percent. Had the seller been an active employee (part-time or otherwise) of the buyer, it would have been possible that the amount received by the seller would have been more. This is because the seller would be in a position to better transfer his personal and professional goodwill. It is my firm belief that the longer the seller can be active in the business, the better the goodwill transition. To this point, I would strongly advocate that a potential seller consider “merging” with a suitable firm, one to three years prior to retirement, with the deal modeled in the same manner as my illustration above. There may be other attributes that you might add to the list; however, as I indicated before, I have found these to be more important. Although I firmly believe that the only “rule of thumb” is that there is no “rule of thumb,” it does seem that average-sized tax and accounting practices sell around 1 times their annual receipts. A multiple of 1 would be a good starting point, and then one would increase or decrease the multiple based upon the attributes I charted above. As shown in the following illustration, the multiple of 1 was increased to 1.2. As mentioned before, these are highly subjective attributes, but nonetheless, an excellent starting point in determining the right multiple for you. Donald P. Wisehart is a frequent speaker and presenter to local, national and webinar audiences. He is a co-author of “Financial Valuation – Applications and Models” and a contributing author of “Valuation for Financial Reporting, 2nd Edition. In addition to his 40-plus years as a tax practitioner, he has more than 24 years' experience in business valuation and litigation support services.